Pro Mark model graphics utilize a new technology and require slightly different handling and application techniques. These are FUEL-PROOF when applied properly and therefore clear coating is not required. Please handle the markings with care. What you see on the sheet and what you will be applying are basically a few coats of paint. Obviously these can be quite delicate. You can also download the Application Instructions here. 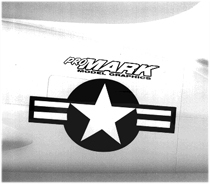 Pro Mark model graphics may be applied to any smooth surface. Cleaning with detergent or isopropyl alcohol is recommended. The carrier sheet is the plastic sheet on which the graphics are printed. 1. 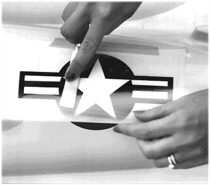 First, cut the desired graphic with its protective backing from the carrier sheet leaving a clear margin. Next, place both pieces, the carrier sheet and backing sheet, in position and tape one edge of the carrier sheet to the application surface. 2. After correctly positioning the graphic, remove the backing, leaving the image and carrier sheet in place. 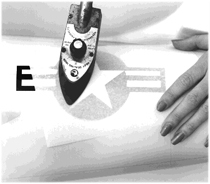 Press the marking against the surface with a Pro Mark wide blade burnishing tool (part # T-1) or similar applicator. 3. Starting from the side opposite the taped edge, lightly burnish the image with a side to side action. With your other hand start lifting that edge of the carrier sheet. You will see the image turn cloudy, this means the image is releasing from the carrier sheet. Continue this action until the complete image is released. 4. Discard the carrier sheet and check to see if there are any bubbles in the image. If so place the backing sheet over the image and burnish with a wide blade tool. 5. 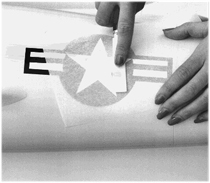 Once the image is transferred from the carrier sheet, seal it by placing the backing sheet back over it. The image is FUEL-PROOF, however, it requires a low heat process to make the adhesive FUEL-PROOF. Use an iron on its lowest setting (if you can't hold your hand to the iron it's too hot). 6. Make a slow pass over the complete image. Gentle heat helps cure the adhesive, other options are to expose the image to an electric UV light or place in sunlight. 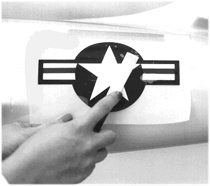 Graphics placed incorrectly may be removed by placing masking tape over them and gently removing. Do this before they cure, and then apply another marking. 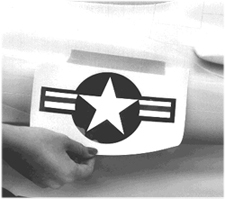 THE CORRECT STORAGE PROCEDURE IS CRITICAL TO THE LONGEVITY OF YOUR MARKINGS. The markings will last a long time if stored in a cool dry place, lying flat and without anything setting on top of them. It is best to keep them undisturbed in the box they came from until you are ready to use them. Ordering the markings should be done no more than a couple of months before you are ready to apply them. Gentle heat will reactivate the glue and make the markings more flexible.